Yubeng Village, Nested in an eastern Himalayan valley, attracted more than 100 visitors daily during its warmer months from May to October, photo by author, 2012. 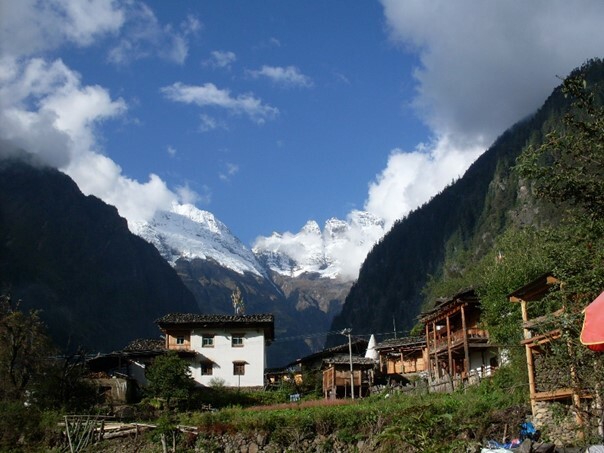 The Tibetan Village Yubeng, nestled deep in the Eastern Himalayan mountains, accidentally gained global fame for its pristine snow mountain peaks and its location that is considered home for deities by 140 Yubeng villagers and numerous Tibetan culture enthusiasts domestic and abroad. A phenomenal tiny place being made on the global stage, the story of Yubeng feeds on a global fascination with “Shangri-La,” the Chinese state’s plan of developing its western frontiers, and a romanticized “ecological” and “original” (yuan sheng tai) Tibetan environment juxtaposed with a polluted China. However, the explosion in numbers of tourists, from dozens per month to nearly a hundred per day during the recent decade, posed a serious ecological challenge: plastic wastes on the sacred mountain paths. If one gets lost in the mountain paths, which isn’t unusual, one only needs to follow the plastic—utensils, energy bar wrappers, portable oxygen cans—in order to get back on track. Due to the unpaved mountain paths unable to connect Yubeng to modern waste processing facilities, local inhabitants have to live with the presence of plastic wastes. The current practice is to collect them, bag them, and wait for transportation by mule and donkey, which is costly and slow. While bursting numbers of tourists shows the rapid pace of development, the persistence of plastic wastes is a constant reminder of the growing environmental impact. The case is an example of the “slow violence” faced by many indigenous people whose material and spiritual worlds are being disrupted by market forces and their remnant wastes worldwide. Plastics, in particular, cause problems in Tibet including polluted headwaters, cattle deaths, and even contamination along a sacred pilgrimage where plastic waste threatens to engulf spiritual objects made of wood, paper, or cloth. Why study Yubeng? The strategy of developing a tourism economy in the Tibetan Autonomous Region is widely adopted by various levels of local government from townships to provincial levels, which consequently goes together with the Chinese state’s strategy of highlighting green GDP when governing its ethnic and religious borderlands. Yubeng exemplifies this scheme. First, the prefecture head who spearheaded this tourist transformation starting a decade ago now has become the Mayor of Lhasa, working to deepen the strategy of development for the sake of stability. Second, while the special visa that foreigners need to access Tibet is difficult to attain—the waiting period ranges from a couple of days to a few months—Yubeng, in a province neighboring Tibet, has become attractive as the second best candidate. In the tense geopolitics between Tibet and China where Beijing asserts Tibet as part of China, the case of Yubeng appears as a mutually beneficial relationship between religious villagers and secular developers. Yet the presence of plastic waste has challenged the whole development scheme. On multiple levels, including environmental, economic, and religious, discarded plastics disturb notions of progress, improvement, and even freedom in state discourse. For villagers who have no choice but to adapt quickly to new requirements in hotel management, tourism means a different way of life. While most villagers adapt well, some have to give up their family houses where many generations of ancestors lived. Rewarded in cash from rents, they seek new dwellings and eventually a new life elsewhere. What is an appropriate way to think of such displacement? My fieldwork in 2011, 2012, and 2014-15 recorded the change in lifestyle in relation to wastes: from very little waste to plastic waste overload. All of this happened in a short time. How do people make sense of this change? Nyima, in his mid-50s, became an environmental activist because he wanted to put his deep knowledge of mountain deities and folklore stories about them to good use; that is, by giving back to his family and friends in the village. He helped edit several books, made numerous presentations, and even produced a film documenting the local cultural change. He found his work gradually amounted to a kind of environmental activism. Stories of deities, as told by his elders, became extremely important, not for tourists’ entertainment, but for a spiritual and ecological curriculum that would benefit all. Deities feed on incense and offer protection against natural disasters and tragedies in life. His earlier involvement in the prefecture government’s project to create stories written on billboards in various languages taught him that interactive methods were best. Back then, he wished to build a larger project of tourism to imitate what he learned about Native American museums based on a fieldtrip to Santa Fe, New Mexico, in 2009. Plastic wastes piled up in the sacred mountain paths alongside lung ta—prayer flags hanging at various locations where deities travel, photo by author, 2015. Now he has changed his thinking after seeing the persistence of plastic wastes. The conundrum lies in the increase of tourist revenues and Tibetan spirituality fading from the landscape. 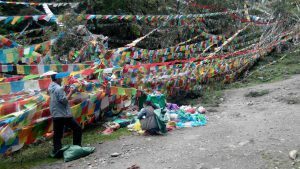 When the mountain deities are out of reach, people forget what an animated the environment we had before,” he commented on the mounting plastic wastes alongside lung ta, Tibetan prayer flags. In 2014-15, he helped to distribute free bamboo sticks to visitors as they entered sacred mountain paths, so that they would not need plastics or metal sticks, nor would they break branches off the trees, as before. He also helped his uncle, in his 70s, to self-publish a book of collected poems about deities that people used to chant as they walk on the paths. To him, the action of re-sacralization will benefit the “environmental” efforts of cleaning up the plastic wastes. It cannot be emphasized enough the importance of paying attention to spiritual worlds as anthropologists analyze cultures and the environment following Roy Rappaport and others. Recent works, under the “ontological turn,” highlight indigenous worlds and world views to be of metaphysical significance. As my ethnography of plastic wastes on the sacred mountain paths here shows, not just anthropologists, but also people who collaborate with anthropologists in the field, are beginning to respond to the challenges of waste by turning to an introspection of and reviving their own spiritual worlds. They make films, publish books, and pursue new spiritual arts of living just as anthropologists of environment reach out to them and to the wider public with skills obtained in long-term engagements and well-articulated research. This is the third short piece in a series of five which are focused on the generativity of waste and its various modalities of power in contemporary China and Taiwan. The series provides a follow-up to the panel “Living through Waste and Waste as Lively” presented November 21, 2015 at the 114th American Anthropological Association Annual Meeting in Denver, Colorado. Bo Wang is a PhD Candidate in cultural anthropology at University of Wisconsin-Madison. His dissertation is concerned with multilayered concepts of solid waste and the cultural work of waste in the context of spirituality, environmentalism, and tourism in Tibetan China. This research was supported by NSF and the Chiang Ching-kuo Fellowship.